Hey friends! Hope your week is off to a great start. Are you keeping warm? I've got two dogs (one in my lap, one on my feet) keeping me warm as I type. We are dog sitting for my parents, while they soak up some sun in Mexico. I've never had a small dog before, and I'm loving having their little Chewie sitting on my lap and keeping me company. 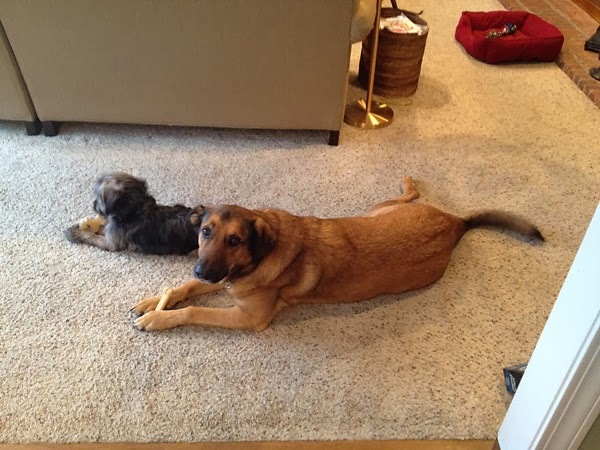 Of course, my big ole' Lucky dog is my shadow, and he's not too happy about Chewie sitting with me all the time. 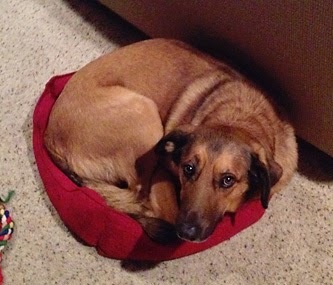 "Listen, you little runt… you sit in her lap, I'll steal your bed." But, Lucky is a gentle giant, and even shares his bone. In other news, I went to West Elm a few days ago. My sister had given me a gift card for my birthday in July, and I was finally going to use it! I love gift cards, but I always feel so much pressure to use it on the absolute best thing ever. You can't just throw away free money, right?! I circled the store for at least an hour, picking up each and every item and analyzing if I really needed it, was it the best bang for the buck, etc. Am I the only one who does this? 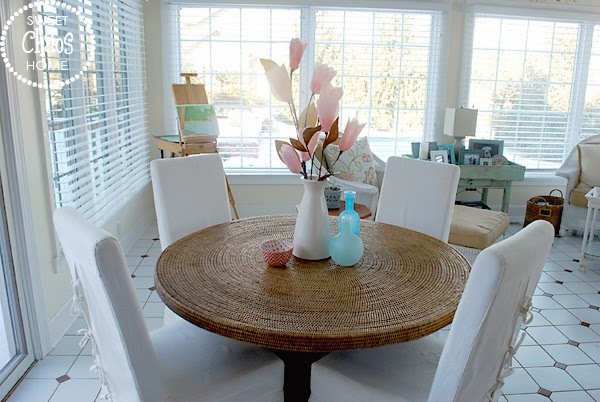 Anywho, I decided to put the money towards items that I could use to create a tablescape in my sunroom. The table had been sitting empty since my last orchid died, and it needed a little somethin' somethin'. 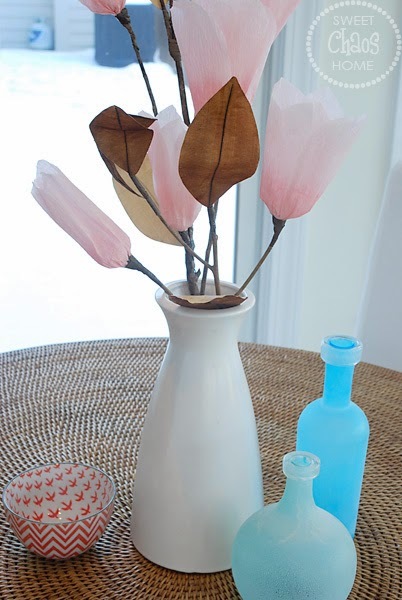 One white vase, one small coral chevron bowl, one blue bottle (I already had the aqua one), and some paper magnolia branches. I really am not sure how I feel about the paper flowers. I typically loathe fake florals, but there's something about these… maybe that they're not trying to look real… that appeals to me. 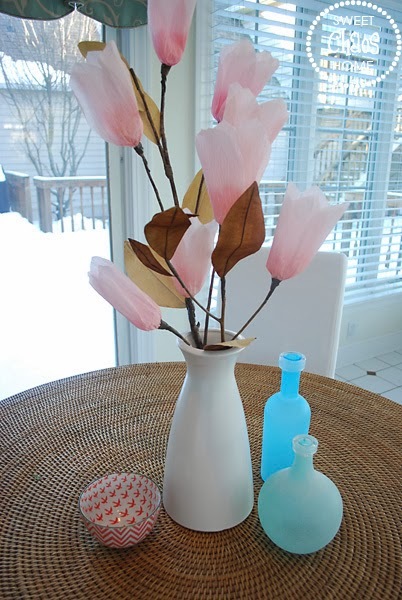 Maybe it's because of all the snow that is continuing to fall, but this little tablescape is making me happy. A little reminder that Spring will eventually get here. It will, won't it?